Airfare, Meals indicated as on your own, Beverages, Tips. The very attractive harbor town of Dingle is an excellent base for our discovery of the Dingle Peninsula. This land juts its mountainous finger into the Atlantic and has been host to various tribes and people for almost 6,000 years. The extraordinary number of ring forts, high crosses, and ancient monuments all bear witness to this long history. 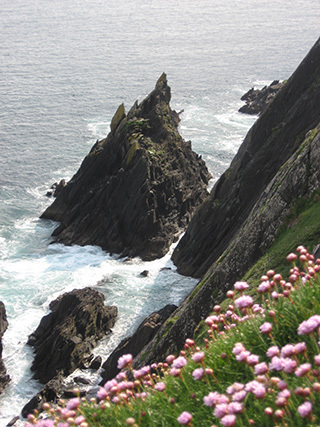 The Dingle Peninsula was once described by the National Geographic Traveler as the most beautiful place on earth. 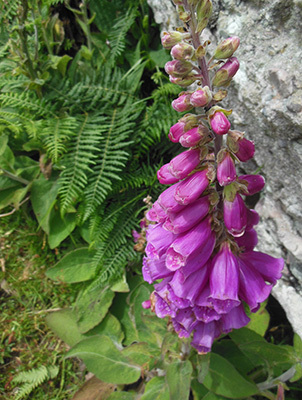 The warmth of the Gulf Stream reaches the Peninsula and gives it an interesting mix of rare and unusual flora. Our hikes will take us via coastal paths and bog roads to Ireland's most westerly parish, Dun Quin. From here we look across to the Blasket Island - the last land before America. Our hikes will take us to the Bronze Age valley of Loch an Duin and along the pilgrim path from Ventry Beach to Gallarus Oratory. 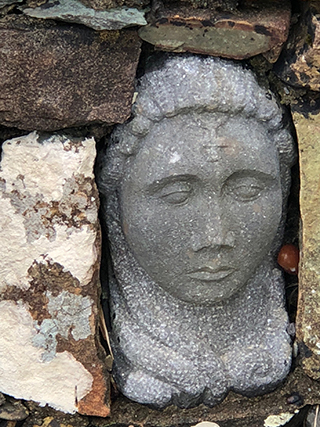 Shaped like an upturned boat, this Oratory is a dry stone building over 1200 years old and the best preserved early Christian church in Ireland. You will find Ballydavid Head with its wonderful cliffs and seascape views a photographer's paradise. Mid-week we will have a tour of Dingle town, with just over 2,000 people it is the only town on the Peninsula. You will find it a lively town well supplied with pubs, lots of music and beautiful crafts. With its panoramic views across Dingle Bay, Greenmount House, a 4 star guesthouse will be our base for exploring the Dingle Peninsula. www.greenmounthouse.ie Our location is only a ten minute walk to world famous music, pubs and restaurants. And the breakfasts at Greenmount are legendary. 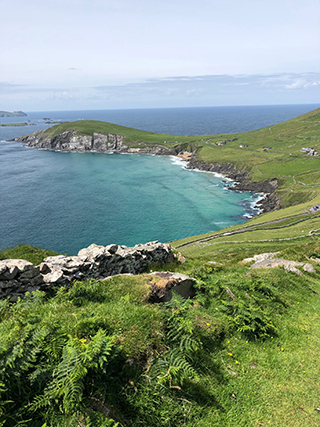 Saturday, June 8 - Dunquin Wild Atlantic Way Walk - This is a lovely walk featuring a combination of coastal cliff walking and some old bog roads through the parish of Dun Chaoin, Ireland's most westerly parish and the heart of the west Kerry Gaeltacht. Expect lots of big skies and Atlantic and Blasket Island views. We will visit the fascinating Blasket Museum - recording the history of the Great Blasket Island, its residents, and their evacuation for good in 1954. Distance: 6 miles; Elevation gain: 600'. 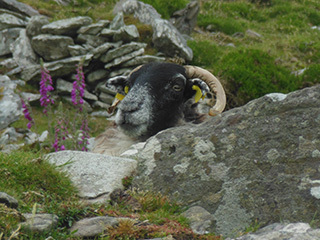 Sunday, June 9 - Loch an Duin Bronze age Valley- This walk back in time is a wonderful combination of Bronze Age archeology and beautiful nature as we explore the valley of the fortified lake. This valley now deserted and covered in bog contains dwellings, rock art, burial tombs and pre bog field walls from over three thousand years ago. And there is also the waterfall of course! Some rough ground, no major ascents. Distance: 6-7 miles; Elevation gain: 600'. Monday, June 10 - Today is officially a "free day". There will be an option of a morning town walk. 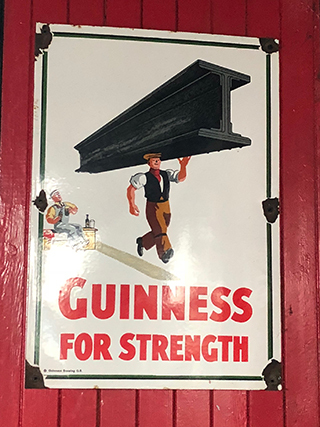 You're free in the afternoon to explore the town of Dingle. Tuesday, June 11 - Cosan na Naomh - Following the old pilgrim path from Ventry beach to Gallarus Oratory. Dating back 1200 years the Gallarus Oratory , this small dry stone structure, is said to be the best preserved Christian Church in Ireland. The Pilgrims path is 17.7km long. We will walk approximately 10km, along quiet country roads, bothaireens (small roads) and farmland. This route is rich in archeology from the early Christian period (5th - 12th century). Distance: 6-7 miles; Elevation gain: 500'. 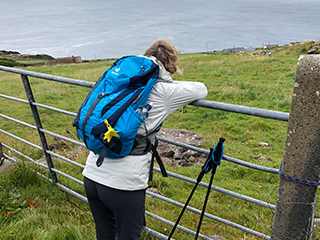 Wednesday, June 12 - We travel today to the western tip of the Dingle Peninsula to walk at Ballydavid Head, for one of the best walks in Kerry. 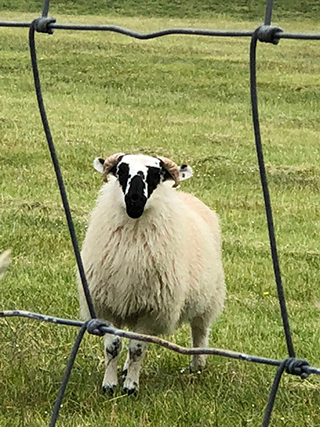 We climb gently through moorland grass to reach a fine vantage point with expansive views of the surrounding hills, fields, mountains, sea and cliffs. This area could be described as a "photographer's paradise". We will take our time to take pictures, relax, and enjoy the views. Distance 6 - 7 miles; Elevation gain 400'. Thursday, June 13 - We will determine the activity for this day during our week. Options we will consider: a boat trip to the Blasket Islands, a hike on Connor Pass or Mt. Brandon. All of these options are weather dependent.